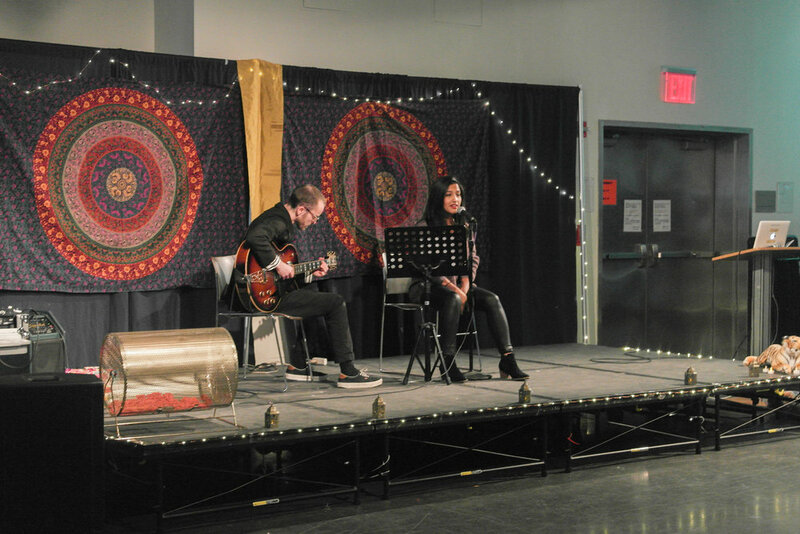 Students enjoyed a night filled with live singers, belly dancing and falafel at the International Student Organization’s biggest event of the semester “Arabian Nights,” which took place in the Multipurpose Room on April 11th. The event was organized by the Baruch International Student Organization and was intended to celebrate Arab culture by offering a taste of Arab art, customs and traditions. It featured both student and professional performances of cultural songs and dance. The International Student Organization’s president and host of the event, Richard Rudman, was very pleased with the turnout this year. As Rudman was hosting the event, he emphasized the International Student Organization’s goal of encouraging diversity, in order to aid international students in adjusting to Baruch. As the event was starting off, students were eagerly waiting for the performances to begin. Most students were particularly excited about the highlight of the show, the belly dancing performance by Syrena Nikole. “I had never seen a belly dancer before, she was so talented. I actually wish I knew more about the Arab culture, I’d like to travel to an Arab country one day and see it firsthand,” student Clifford Lalanne later said. Students from the International Student Organization also danced to a Moroccan beat, offering a taste of a different type of Arabic music, other than the Egyptian music that had been playing throughout the night. There were numerous singers who performed as well. Singer and songwriter, Neel Nadkarni presented numerous pieces of Bollywood influenced music. Singer Rian Jali also performed a number of different genres of music including Beyoncé’s “Halo,” where students began to sway candles and flashlights up in the air to the sound of her voice. “I fell in love with the Arab culture today,” student Mohammad Raza said. Some students had expected a wider variety of Arabic music. “I loved the event, but as an Arab, I noticed that most of the songs were not Arabic,” student Maryam Saad said. The performances that were presented served to celebrate the long-standing Arab traditions and culture, with all of its intricate designs, dances, and food. A similar event that the International Student Organization will be hosting will also have a similar goal, Rudman said.